I'm really please with the way this one came out - the pattern is inspired by a quilt created by John Adams, a/k/a Quilt Dad. You can view his blog here and see his original pattern on The Moda Bake Shop website. I say mine was inspired by his because I used fabric I had on hand instead of buying the honey buns and charm packs as listed in his design. His way would definitely be easier, with a lot less cutting! 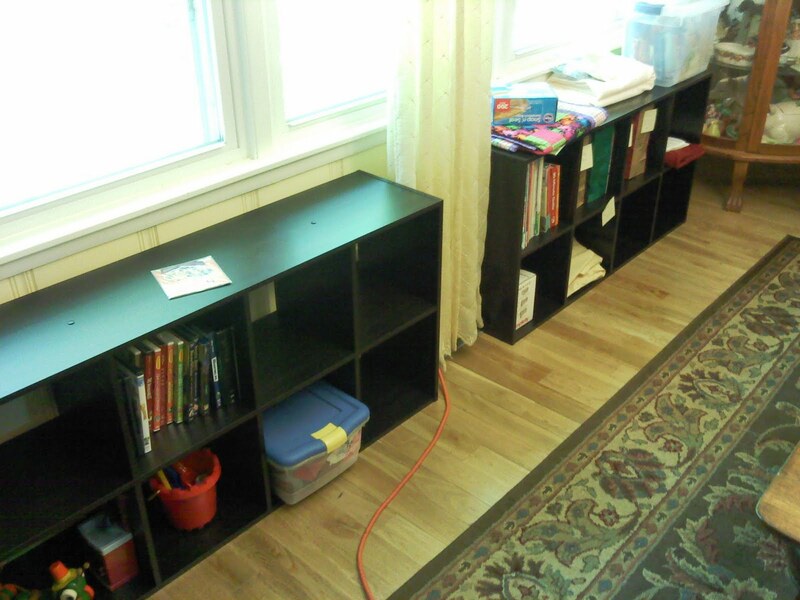 I also mentioned earlier this week that I was putting together bookshelves for my dining room to hopefully corral the sewing projects into something nicer than the plastic bins that are in there now. Funny thing - when I put the first one in place, Lilli took one look at it, and ran off to get a stack of books! She's definitely taken over one of the bookcases, which is okay, since her toys were getting kind of scattered. Now at least there's a place for her to put them. I've put my quilting books and magazines on mine, alongside Starbucks bags (I knew those things would be useful someday!) containing the fabric for future projects. Hopefully I'll come up with a "prettier" way to organize it, but for now at least it's not plastic bags and tubs! Although I see that Lilli's already started to rearrange the labels I put on the bags..... It's still a work in progress, although I hope it looks a lot better by the time my hubby gets home tonight. What a surprise that would be for him!! Hey, guys, go check out Sew and Tell Friday at amylouwho's blog - it's lots of fun!! this looks really beautiful. your little helper is adorable. That turned out beautifully! Great that you were able to pull it all out of your stash. I love the colors. Your little assistant is a cutie-pie! This a beautiful quilt! Great colors. What an angel of a little girl! I have to agree with you, she does make the picture so pretty. Very adorable little girl. I really love the fabrics you used. I have been wanting to try this pattern. You have just given me a little push to start seriously thinking about it. 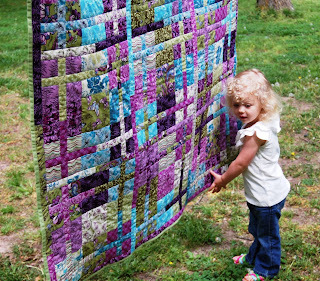 Sarah your quilt is gorgeous as is your little helper! I would definitely put her in all your quilt photos. 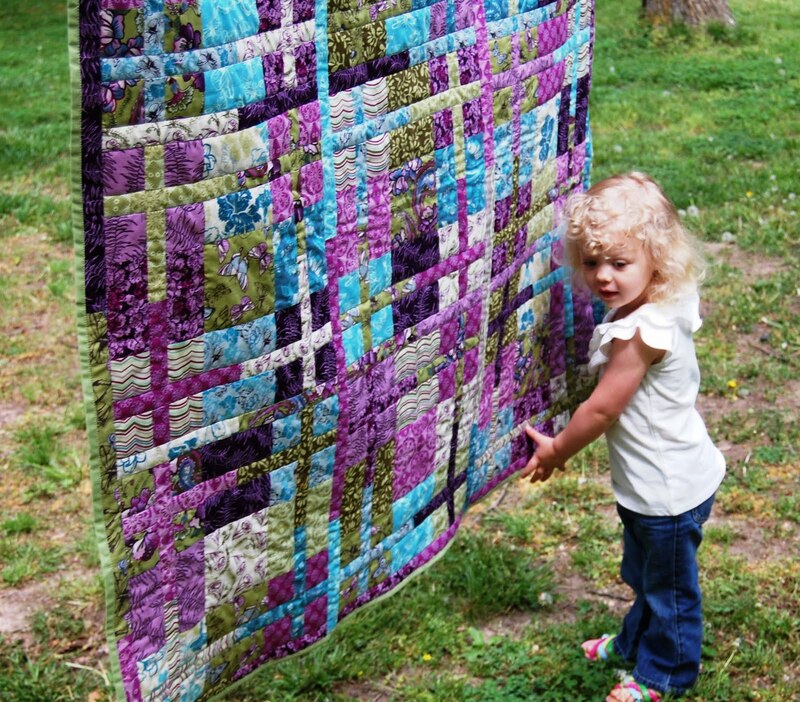 I like the colors you used in your quilt. Good luck with the organizing. 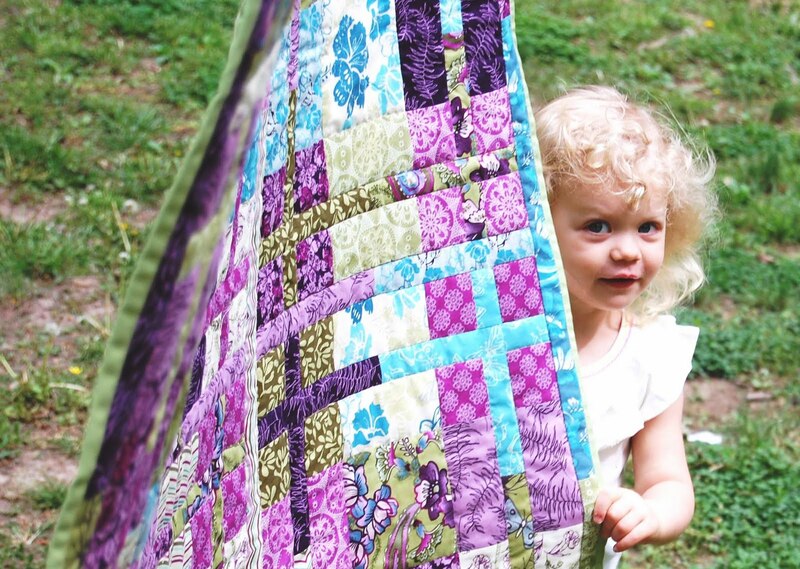 Your quilts look wonderful Sarah! And Lilli is a perfect assistant! Love the bookshelves... very cool! Lovely!!! Your choice of colour is wonderful and your wee assistant is adorable! 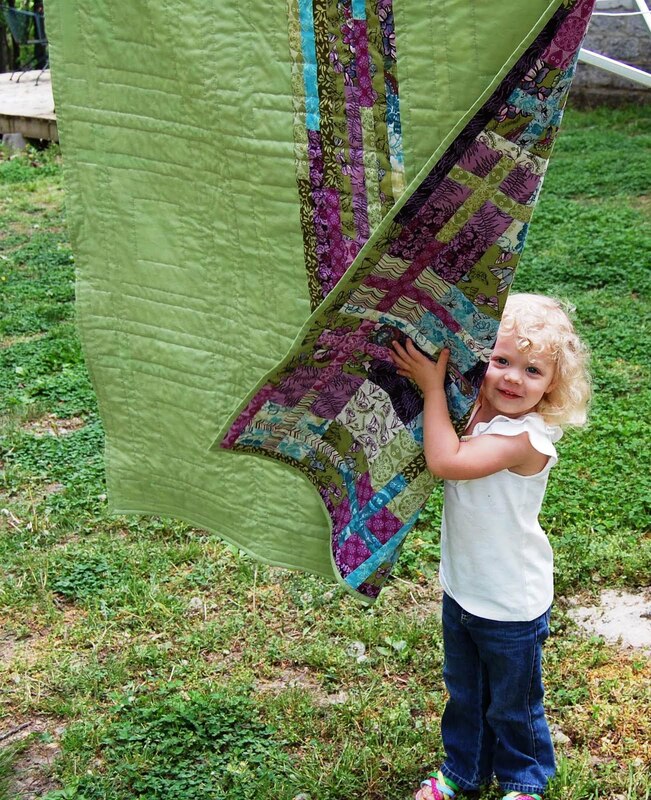 I love the colors that you used for the quilt (and a pretty little assistant as well). They are both just beatiful! 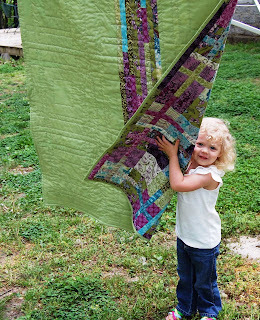 I saw your quilt on quilt dad's blog and had to come look at your blog! She's adorable and so is your quilt! Great color combos and you didn't have to buy anything new? Good for you! My Off the Grid is taking forever. Such an easy pattern, but I never seem to get that last block done. Supersize It - a little more Sew and Tell!! Sew 'N Tell - One More Down! Today I learned some new stuff!